A shabu-shabu restaurant on top of a fake tree? Its like a childhood dream come true. If you have ever wanted a treehouse, but your parents never would buy/build you one, Gajumaru restaurant in Okinawa is not going to make you feel any better. 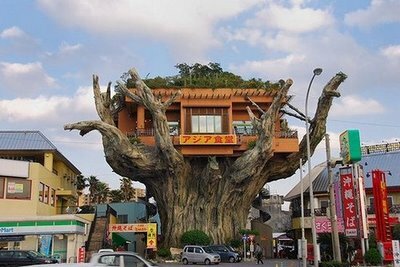 Near the Naha airport, there sits a restaurant high atop a fake tree that looks like something out of a Hayao Miyazaki film. Short of any woodland creatures that can also double as a catbus, the current edition of the restaurant is a shabu-shabu joint that should make all of your neglected childhood dreams come true. The view from the restaurant is spectacular. Diners will ascend a winding stairwell which will lead them to a perch that gets all patrons a stunning view of Naha Harbor.